We continue to add Minecraft PE mods that allow you to move from one place to another much faster. This time, you get a real golf car having 6 different colors. Cars have identical characteristics and appearance, except for the color. Golf car has a fairly high speed compared with normal walking, and can be broken if you get into the water. How to get a golf car and how to control it? 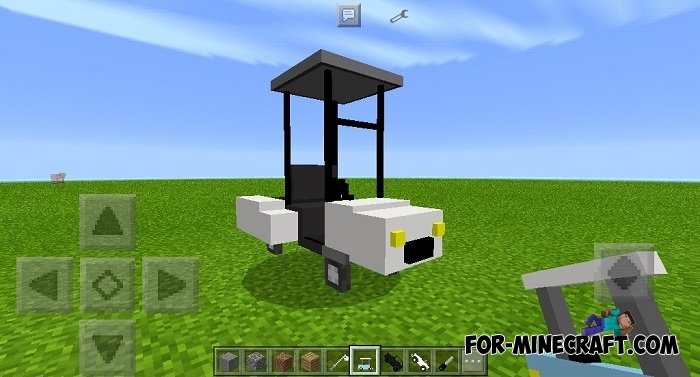 Golf car replaces the ordinary pig, so take a pig spawn egg and throw it on a flat surface. Then take a carrot on a stick in hand and sit in the car. You will go in that direction in which the stick is directed. 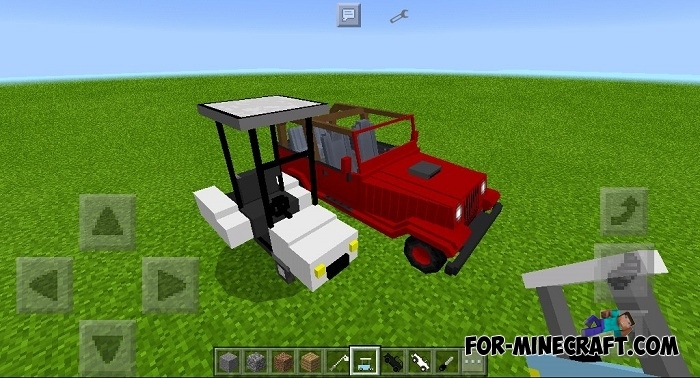 How to install the Golf Car mod? Download the archive and extract Golf Car behavior and one of the colors. Then start the game and click on the wrench -> ModPE -> Select the texture pack. Go to the world settings and activate the behavior file.